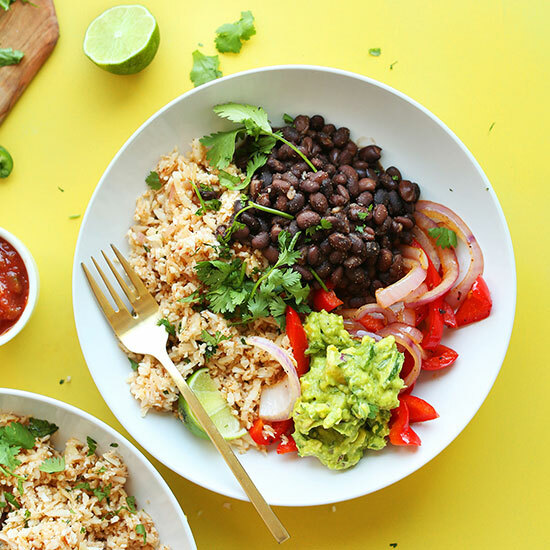 Flavorful 30-minute burrito bowls made with seasoned cauliflower rice, black beans, grilled peppers and onions, and guacamole! Hearty, plant-based fun. Add beans to a small saucepan over medium heat and season with spices to taste. Once bubbling, reduce heat to low and stir occasionally. Prepare cauliflower rice by following these instructions. Then heat a large rimmed skillet over medium heat. Once hot, add oil, garlic, onion, and a pinch each salt and pepper. Sauté for 1 minute, stirring frequently. Then add cauliflower ‘rice’ and stir to coat. Place the lid on to steam the rice for about 2-4 minutes or until almost tender like rice (al dente in texture), stirring occasionally. Chop up your bell pepper and onion at this time. Remove rice from heat and transfer to a large mixing bowl. Add lime juice, cumin, chili powder, salsa and fresh cilantro. Stir to combine and taste and adjust seasonings accordingly, adding salt, pepper, lime juice, salsa, or more spices as desired. Set aside. Heat the large skillet back over medium-high heat. Once hot, add oil, bell pepper and onion and a pinch of sea salt. Sauté, stirring frequently, until slightly softened and they take on a little color - about 4 minutes. To serve, divide rice, beans, and peppers between serving bowls. Enjoy as is or with corn tortillas, chips, salsa, lime juice, hot sauce, or guacamole (recipe in notes). Best when fresh, though leftovers keep for 2-3 days in the refrigerator. Serve with desired toppings (listed above) or as is. I recommend avocado, lime juice, hot sauce, and cilantro. Best when fresh, though leftovers keep covered in the refrigerator for 2-3 days. Reheat in a 350 degree F (176 C) oven until warmed through - about 20 minutes. See notes for instructions on making ahead of time. *Guacamole (amount as original recipe is written // adjust if altering batch size): Mash 2 ripe avocados with 1 Tbsp (15 ml) lime juice, 1 Tbsp (15 ml) lemon juice, 1/4 tsp sea salt, 1/2 jalapeño, deseeded and sliced, 1/4 cup (40 g) diced red onion, and 1/4 cup (20 g) diced cilantro. Taste and adjust seasonings as needed. *Recipe adapted from / inspired by my Cauliflower Rice Stuffed Peppers. *Nutrition information is a rough estimate calculated without additional toppings or guacamole.